Whether you are a backpacker, camper or traveler, making sure you have clean water is essential. Forget the iodine pills or the time it takes to boil water. 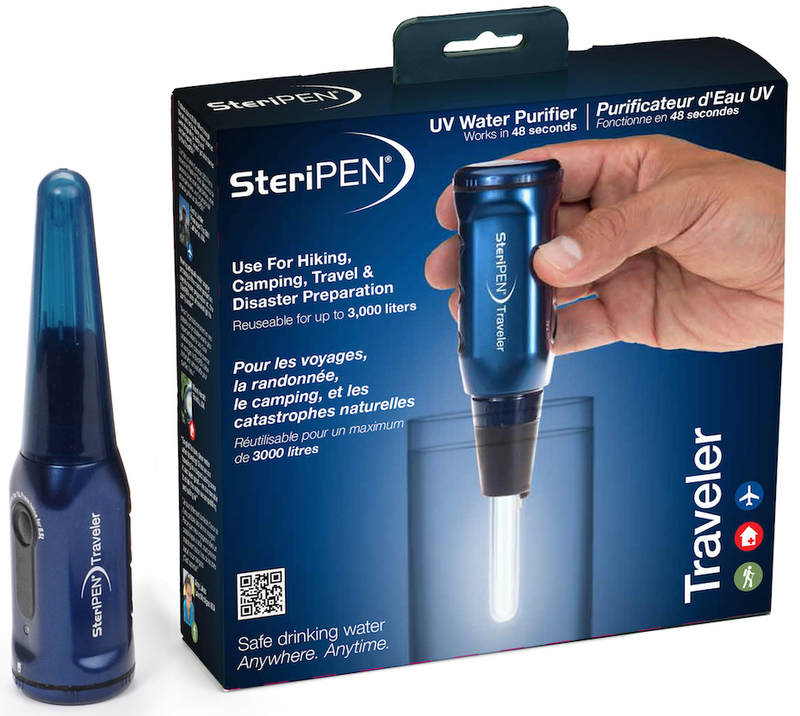 The SteriPEN Traveler uses UV light to purify water conveniently, quickly and safely. Even if you are not off the beaten path, many urban destinations in underdeveloped countries may have tap water that is not always safe. It’s easy to ensure your water is clean by simply pulling out this wonder wand. I am not going to lie – I have even pulled it out of my bag in South America before to purify a glass of tap water at a café. Better to be safe than perhaps sorry later! The SteriPEN Traveler costs only $49.95 and is powered by 4 AA batteries. It will disinfect a half liter (16 oz.) of water in about 50 seconds or about a liter (32 oz.) in 90 seconds. In fact, it will purify 200 half-liter servings of water on just one set of AA lithium batteries! All it takes is pushing one button to activate, immersing the wand in a bottle of water and stirring for the indicated about of time. It’s that easy. One of the things that I love about the SteriPEN Traveler is it’s made to fit perfectly into commercial water bottles. If you are familiar with SteriPEN, they make seven different models of purification wands. But besides the affordable price of this one being under $50, what I love about this model is how compact it is and the nice travel case for protection. It’s also durable and has a one-year warranty. I consider this to be an essential part of my travel gear when trekking or going to a developing country. Learn more on their website: http://www.steripen.com/traveler.